AMMONIA: 1 Tbsp. clear household ammonia in 1/2 cup water. Always pre-test. DETERGENT: 1 Tbsp. colorless, mild detergent or dishwashing liquid in 1 cup lukewarm water. 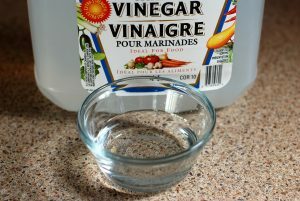 VINEGAR: 1/3 cup white household vinegar in 2/3 cup water. with care or call us.